Can you believe that March is nearly over? 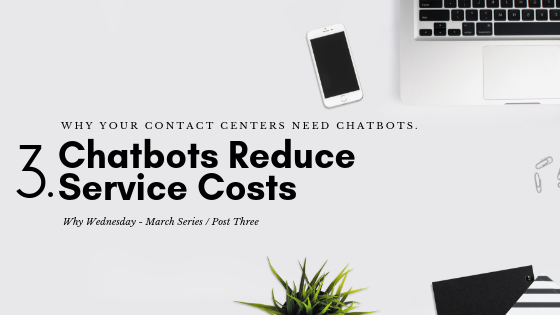 In the final post of our March “Why Wednesday Series” covering one of the final reasons why your contact centers need chatbots. In post one, we discussed the first reason in our series: Chatbots improve the customer experience. Chatbots can help dissolve a variety of barriers or blockers to the customer experience, like long queue times, complex processes for simple questions, 8-5 service centers, and lack of non-phone related channels, to name a few. Chatbots empower customers to self-service, instant answers, and personalized experience. In post two, we discussed reason number two: Chatbots improve Agent Productivity and Efficiency. Chatbots handle the high volume, easy questions, allowing your agents to prioritize the complex questions and experiences. They can also collect the relevant information up front, allowing the agent to immediately/seamlessly serve the problem or question at hand. All of this empowers agents to keep customers happy, turn bad experiences into good experiences, encourage customer loyalty, and even find opportunities for up-sell/cross-sell via Salesforce Next Best Action. This brings us to our final reason, chatbots help reduce service costs. Up until now, we have only covered how chatbots improve the agent and customer experience, but the great thing is that they accomplish this AND it saves business dollars. Chatbots do this by automating several high cost/time areas while also moving people off of expensive phone channels. We probably don’t need to tell you that Digital Channels are cost effective. They are the channels of choice and the ones your customers are already using. Leveraging Salesforce Service Cloud, these channels are already at your fingertips and waiting to be put into action. Chatbots then offer an additional layer of savings via automation. By deploying a conversational chatbot that can handle the high volume, simple questions your customers are empowered to self-service and this then helps the customer service reps to concentrate on the complex questions. This lowers average handle time (AHT) that a representative spends with each customer which in turn saves money. While chatbots bring a huge ROI and CSAT improvement opportunity, there is a lot of design, best practices, and skill required to do them well and achieve those goals. Partnering with a thought leader that understands the technical, conversational, and business uses cases will help you deploy a best-in-class bot that will wow your customers and gives your agents the tools to be successful. Our mission, as the leading AI & Einstein partner of Salesforce, is to help business increase productivity, help you automate service processes, and reduce costs, all the while improving the customer experience. *Interested in learning more? Set up a demo with our expert team to discover the opportunities and estimated ROI a Chatbot solution can provide your business. Engage with Flashbot to set up a demo today!